Several items from the Dome have already been put up for auction, including the pitchers mounds used when the Minnesota Twins called the Metrodome home. MINNEAPOLIS — Want a blue seat from the Metrodome? That’ll cost you $60. The Minnesota Sports Facilities Authority announced Friday that seats from the soon-to-be-demolished Metrodome will be sold by Albrecht Signs, a local company from Fridley, Minn. There are three different prices for the seats, with a regular season seat costing $60 plus tax. For groups interested in purchasing seats at a non-profit rate, the blue chairs will be sold at $40 apiece. The MSFA also lists special location seats, if available, will be available for $80 each. "A number of Minnesota organizations wanted seats for new or old ballparks, and we wanted to be able to make them available," MSFA chair Michele Kelm-Helgen said in a release. "Albrecht presented us with a very fair pricing plan, and we are happy to partner with them." 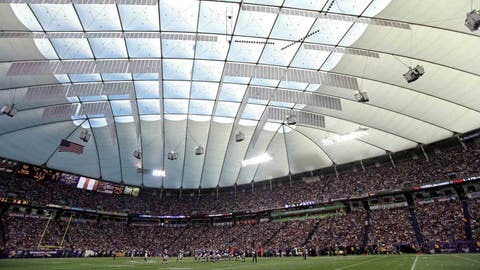 The Metrodome will host its last game this Sunday when the Minnesota Vikings take on the Detroit Lions. After that, the outdated indoor facility — which opened in 1982 — will be demolished to make way for the new Vikings stadium on the same site. Several items from the Dome have already been put up for auction, including the pitchers mounds used when the Minnesota Twins called the Metrodome home. Many Twins and Vikings fans, however, have been wondering about the blue plastic seats and whether they would be available for purchase. For just $60, fans can purchase these seats for their own use. According to the MSFA, though, purchase agreements for orders of less than 200 seats must be completed by Jan. 7, 2014, while groups wishing to buy more than 200 seats must finish those agreements by Jan. 2. Albrecht Signs is expected to have more information on the purchase and pickup of the seats at their website, www.albrechtsigncompany.com.